Both LG (the V30) and Google (Pixel 2 XL) recently introduced smartphones that use LG's new pOLED smartphone displays, both with the same display - a 6" 1440x2880 (537 PPI). An early pre-production review of LG's V30 claimed that the display suffer from serious quality issues, and now reviews of commercially-sold units confirm the display problems. ArsTechnica reviewed the Pixel 2 XL and LG's V30, and found that both displays suffer from the same issues (which is unsurprising as this is the same OLED panel). According to the review, the "dirty" grain to it, and you can see it all the time if you know what to look for. This is most noticeable in a dark room with the screen at minimum brightness. This is also visible whenever there is a solid color background. 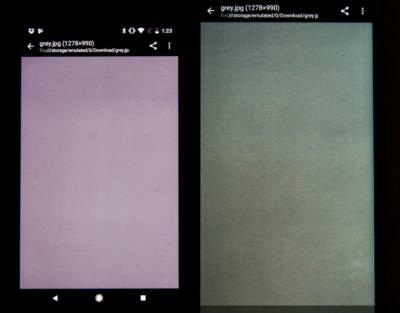 Comparing the Pixel 2 XL with the Pixel 2 (which use an SDC AMOLED), ArsTechnica says that it is easy to see that the LG-made Pixel 2 XL screen is grainier and blotchier than the Samsung-made Pixel 2 screen. You can see an example in the image above. The Verge's review of the V30 is even more harsh. The review says that the display has color issues - large areas of the same color shows streaks of gray as if the backlight is inconsistent (of course there is no backlight in an OLED). The display does not manage to render color gradations smoothly, and there is an unpleasant color banding and grainy gradients. The reviewer concludes his phone's display saying that the OLED screen is "just bad" and it is an ugly disappointment and ruins an otherwise excellent phone. This is obviously a big disappointment. LG did manage to produce excellent pOLED displays for Apple's Watch, but seems not to be able to have good enough quality control for its new larger displays. In August we reported that LGD is still facing very low yields at its 6-Gen E5 line, and so has to produce the V30 displays at its Gen-4.5 flexible AMOLED line. Will LG produce the OLED screen for Google's upcoming 2017 Pixel XL smartphone?